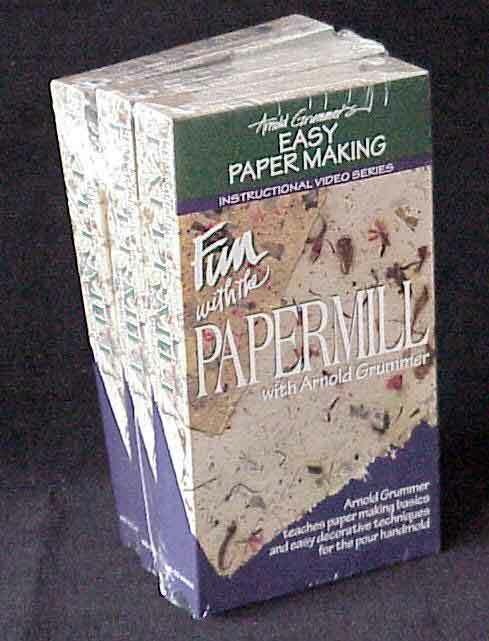 Arnold Grummer'Fun with the PAPERMILL,' FOR THE BEGINNER Learn how to make paper in minutes with Arnold Grummer. From the basics to unique techniques using a pour mould. Volume 1: $14.95 Basic Sheet Making, Adding Color, Inclusions & Botanicals, Surface Embedment. Volume 2: $14.95 Painting with Pulp, Sheet Layering, Making Paper Shapes, Deckle Division. Volume 3: $14.95 Surface Treatments, Creating Texture, Embossing & Glazing, Watermarks. Volume 1: $39.95 Basic Sheet Making, Adding Color, Inclusions & Botanicals, Surface Embedment. Volume 2: $39.95 Painting with Pulp, Sheet Layering, Making Paper Shapes, Deckle Division.